Matthew Barney, Redoubt, 2018. Production still. In his first major exhibition at his alma mater, the renowned and provocative contemporary artist Matthew Barney, B.A. 1989, presents his latest work, including a new feature-length film titled Redoubt. Set in Idaho’s Sawtooth Mountain range, the film layers classical, cosmological, and American myths about humanity’s place in the natural world, continuing Barney’s long-standing preoccupation with landscape as both a setting and subject. Redoubt loosely adapts the myth of Diana, goddess of the hunt, and Actaeon, a hunter who trespasses on her and is punished. Like most of Barney’s previous films, Redoubt contains no dialogue; instead, the characters communicate through choreography that echoes and foreshadows their encounters with wildlife. In addition to the film, the exhibition features pieces in other media that demonstrate casting and electroplating techniques developed by Barney for Redoubt. Four large-scale sculptures were made from the trunks of burned trees harvested by the artist from the Sawtooth Mountains. Also included are engravings on copper plate created during the filming of Redoubt as well as a series of electroplated copper reliefs that depict imagery from the film. 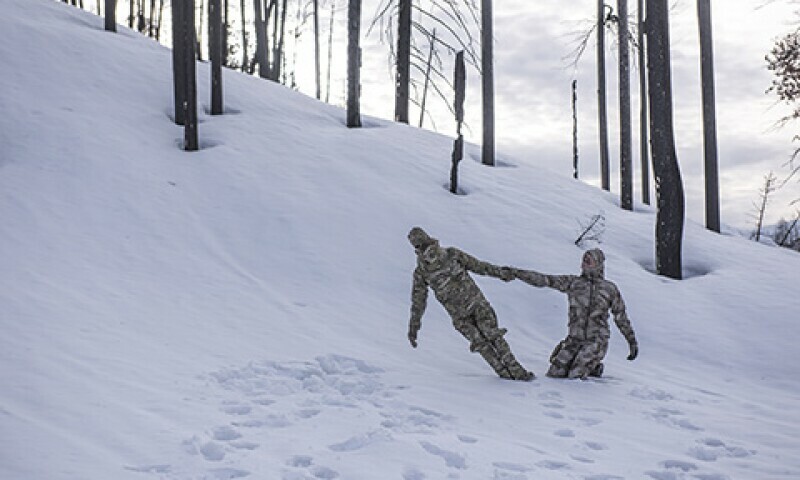 Touching on themes of artistic creation, ecology, and dance, Matthew Barney: Redoubt showcases the artist’s trademark interdisciplinary and multimedia approach.